Please consult the laboratory before sending your peat samples. Pretreatment – Please contact us to discuss the nature of your research objective to ensure the most appropriate pretreatment is applied to your peat sample. You are welcome to request that we contact you after the pretreatment to discuss options for dating on the data sheet. Wet Samples – Peat can be sent either damp or dry, whichever is more convenient for clients. Generally, the laboratory prefers that the samples be left damp as it may be easier to extract macrofossils. The laboratory’s recommended sample size is 50-100 milligrams (approximate dry weight), but this is not always required. When sending wet or frozen samples, please remove excess water then wrap the sample with plastic (e.g. Saran Wrap) to limit air contact, place them in a Ziplock bag, and ship to us. Please contact us before sending your samples so we can provide initial assessment if you have enough sample for radiocarbon dating. Peat samples are very common materials for radiocarbon dating. They are usually comprised of a wide array of materials, ranging from (1) very fine organic rich silts (silty peat or organic sediment) with very little to no plant macrofossils, to (2) very fibrous robust plant remains (seeds, bits of charcoal, reeds, plant stems) with very little silt. Many times peat is composed of unrecognizable decayed plant remains that are essentially a mix of everything that was deposited and then decayed in place or a mix of silty peat with some fibrous materials. Before sampling, you should decide what you want to discover and then, depending on the composition of the peat (mostly silt or mostly fibrous or a mix), decide what fraction of the material contained will be most appropriate for your research. It is also important to consider the size of sample to be sent to the lab, i.e. how little or how much of a vertical sample must be taken from the core and if they should be taken only at contacts or facies changes (onset / offset of deposition markers, etc). In general, the robust or decayed plant remains are the best materials for radiocarbon dating as they will allow for additional pretreatment (alkali extractions) to remove any mobilized humic acids present. If not removed, the humic acids may bias the age typically in the more recent direction. This assumes that the plant remains do not contain any intrusive root material (stringer roots) that grew from overlying peat layers. In some instances, depending on the consistency, silty peat can be treated with alkali. Since silt is usually mostly humic acids and some humins, the alkali extractions may or may not be as effective on silty peat as it would with the plant matter. Whenever possible, it is best to extract out unique plant remains that you know were deposited in situ and send them for radiocarbon dating. If this is not possible or practical, you may send the bulk sample and we will sieve and extract all the various fractions present and pretreat them. We will then send photos to the client of the macrofossils available for radiocarbon dating. The client will decide what materials will be dated. When researchers are not sure what fraction will yield the best date, they opt to date both the fibrous (plant macrofossil) and silt separately to compare the results. This sometimes may be useful if the researcher suspects intrusive material being deposited or if the system is a high-energy depositional area and/or if the silt is being rinsed in and out of the fibrous material. 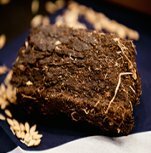 If you are not sure how much peat to send, you can submit multiple slices of the core and give us instructions to date sample A first, if not enough add sample B, C, D and so on. This allows a researcher to date the smallest possible slice of deposition to get the most accurate date since adding more and more layers may, in some cases, cause the age reported to be more of an average time of deposition than an actual “event” date that shows a more precise result. Peats are treated similarly to organic sediments, with the main difference being that humic acids can be more of an issue with peat samples. In general, the peat will be floated and sieved between 125 to 180 microns to remove and isolate macrofossils (plant, shell, etc.). If macrofossils are found in sufficient quantities, they will be pretreated according to the material type (typically acid/alkali/acid). Unless otherwise instructed, we will retain the sediment/muck fraction and upon completion we will contact you with options for radiocarbon dating. If you have special requests regarding the fraction you wish to date or would like to date both, please indicate this in the data sheet. Mucky peats are limited to acid-wash pretreatments to ensure the absence of carbonates. Alkali pretreatment, applied to ensure the absence of humic acid, generally requires vegetable matter to be present. Quite often peat will have mucky, sediment, and fibrous fractions. These are generally separated during pretreatment, often with the fibrous fraction receiving alkali pretreatment and the sediment fraction not receiving alkali pretreatment. If you know which fraction may be better for radiocarbon dating, or if the combination of the two is the best choice, please indicate this in the data sheet. Silty peats that do not have any macrofossils can be dated usually on the acid-washed fraction to remove carbonates. Afterwards, the bulk organics are dated. Sometimes we can also apply an alkali extraction to remove humic acid, but this is dependent on size and also if the fine-grained silty peat does not dissolve in the alkali. These are more typical and most are mixtures of fine-grained silt and decayed plant remains (e.g. bits of charred material and sedges, reeds, etc). In this case, usually the fibrous material or distinct macrofossils are extracted and given a full range of acid and alkali treatments to remove carbonates and humic acids and then dated. Regardless of the type of peat submitted, we will isolate any fraction, pretreat them accordingly, and then contact the client with their options as to what may be dated in each sample.